My only previous exposure to Inspector Jules Maigret of the Flying Squad has been via the Michael Gambon adaptations for TV. This is not surprising given that until recently my reading of classic crime fiction was largely based on trawling my mother’s collection of American and English writers. 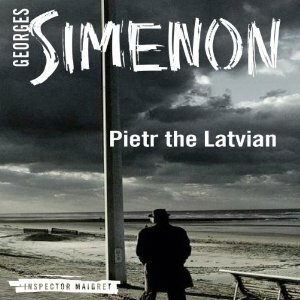 But given that Georges Simenon’s first Maigret book was published in 1930, this month seemed like the perfect time to listen to the audio book I’ve owned for 18 months. The case at the heart of PIETR THE LATVIAN is at once complicated and not terribly interesting. It should be interesting. There is an internationally known con man and mysterious identity doubles and some pretty shocking happenings that ought to have gripped me. But somehow it read like some distant relative’s journal of their trip to a place that doesn’t have a tourist board. I listened to a recently published audio version and at several points realised my mind had wandered and I didn’t know what had just happened. Or care very much. I did persevere (not least because there were other things to like about the novel) but if you’re the kind of reader who needs an engaging plot this might not be the one for you. I did enjoy the fact that it was quite different from its English and American contemporaries, although I would say it’s closer to the American style if pressed. It’s got a very European sensibility though, with a missive from the 1930 version of Interpol setting the whole thing in motion and lots of cross border activity and people from all over Europe playing key roles in the story. There’s more than a hint of French existentialism too which is possibly why the story did not engage me as much as I might have hoped (I blame Sartre for my one failed course at university). There are hints of the hard-boiled though and any of the situations that would, in an English equivalent, provide some glamour are instead full of grit and solemnity here. And although there is a lot of legwork there’s precious little of the detecting that a traditional procedural would offer. It’s all hunches and pipe smoking and observing human behaviour that solves the crime here. I also liked the introduction of Maigret because do get to know quite a bit about him, at least outwardly, which is not always the case in mystery fiction of the era. He didn’t have a moustache and he didn’t wear heavy boots. His clothes were well cut and made of fairly light worsted. He shaved every day and looked after his hands. But his frame was proletarian. He was a big, bony man. Iron muscles shaped his jacket sleeves and quickly wore through new trousers. He had a way of imposing himself just by standing there. His assertive presence had often irked many of his own colleagues. We also learn that he likes his beer (or really any alcohol at all at pretty much any time of the day) and to warm himself via the coal stove in his office. His inner life is more difficult to discern, though we find out he is unable to cry even when the situation might reasonably call for it and he’s also pretty darned resilient. By my reckoning he goes for about three days without sleep at one point (fulled by beer and sandwiches) and performs some quite amazing physical feats after being shot. In the TV adaptations Maigret’s wife is quite prominently featured but this is either an invention of the script writers or comes later in the novel series. Here Madame Maigret is barely mentioned and her only purpose is to fluff the Inspector’s pillows towards the very end of the novel. As far as its setting goes both time and place are quite evocatively brought to life. This makes the book enjoyable but also awkward. Some of the attitudes about race in general and Jews in particular make the modern reader wince and it’s not hard to remember that at this time not very far away the National Socialists were gaining popularity in Germany. So, even though I wasn’t swept away by the story I did find quite a lot to enjoy about this book and will definitely read later books in the series at some stage. My version was wonderfully narrated by Gareth Armstrong (though his accents are all English if that matters to you, I prefer that to fake French ones but it’s worth mentioning) and has been recently re-translated by David Bellos in what feels like a very authentic manner. This entry was posted in book review, France, Georges Simenon. Bookmark the permalink. I’m glad you enjoyed this one, Bernadette. I’d agree with you that Simenon’s Maigret novels are distinct (i.e. they are different to American and English crime fiction). I actually like Maigret’s character quite a lot. As you say, he’s resilient, but he isn’t a cartoonish sort of superhero. I haven’t read any of his books in quite a while. I have several to try and they are all very short, so I don’t know what I am waiting for. I did read a few non-Maigret books and enjoyed them.